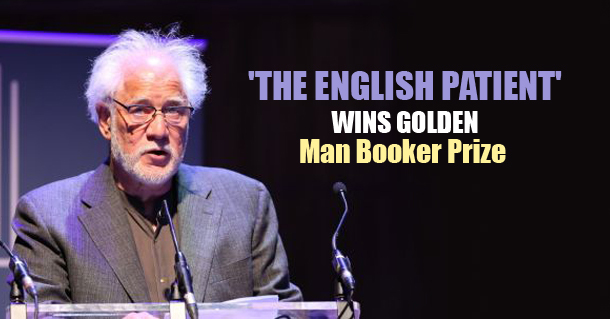 The English Patient by Michael Ondaatje (Bloomsbury) has been crowned the best work of fiction from the last five decades of the Man Booker Prize. This was declared at the closing event of the Man Booker 50 Festival in Royal Festival Hall at Southbank Centre in London. The winner of this special one-off award for the Man Booker Prize’s 50th anniversary celebrations was chosen by the public. All 51 previous winners were considered by a panel of five specially appointed judges, each of whom was asked to read the winning novels from one decade of the prize’s history, before the books faced a month-long public vote on the Man Booker website. “The English Patient is a compelling work of fiction — both poetic and philosophical — and is a worthy winner of the Golden Man Booker,” said Baroness Helena Kennedy, Chair of the Booker Prize Foundation. Michael Ondaatje is one of the world’s foremost writers, whose work has influenced an entire generation of writers and readers. Although he is best known as a novelist, Ondaatje’s work also encompasses poetry, memoir, and film, and reveals a passion for defying conventional form. He is one of only two authors whose work has won the Booker Prize and an Oscar, and his latest novel, Warlight, has just been published by Jonathan Cape. The English Patient was selected by the novelist Kamila Shamsie to represent the 1990s. “The English Patient is that rare novel which gets under your skin and insists you return to it time and again, always yielding a new surprise or delight,” judge Kamila Shamsie said in statement. The novel won the 1992 Booker Prize and the 1992 Governor General’s Award. The book was adapted into a 1996 film by Anthony Minghella. The film received nine Academy Awards — including Best Picture and Director — at the 69th Academy Awards.